The Instagram-based label reconstructs vintage designs to attract a celebrity following. 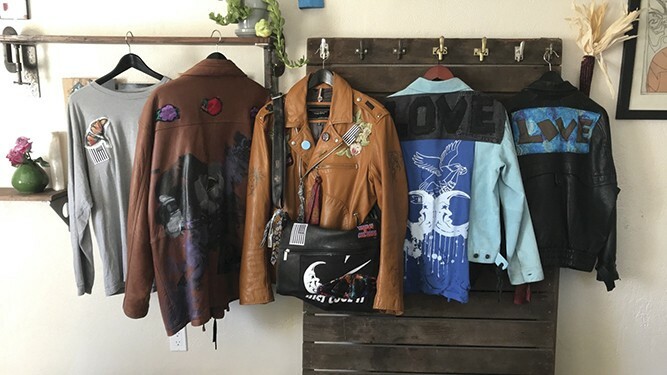 Leader of Cool Moons' reconstructed jackets include custom patchwork, buttons, and embroidery. The headquarters of fashion label Leader of Cool Moons is located in a gutted basement in East Oakland. Creative director Dotty Ransom escorts me downstairs and tells me to duck as my head skims the low ceiling. We enter a small room in the back where fabric he has picked up from thrift stores and bargain shops is stuffed into shelves piled to the ceiling. In the center of the room, a handful of denim jackets rest on his workstation, a long folding table with a single Singer sewing machine. The jackets are handmade or reconstructed, decoratively detailed with custom patchwork, buttons, and embroidery. More than a headquarters, this is Ransom's DIY design man cave. Leader of Cool Moons is something between an ode to punk style and the nostalgic feeling of wearing your boyfriend's letterman. Established as a unisex line, it includes '90s threads that have been deconstructed and re-stitched into expressive streetwear fit for an urban dystopia. Collections include cut-and-sewn jackets, tees, and sweatshirts, all hand-dyed, distressed, and detailed by Ransom. The 32-year-old Stockton native established his brand by marketing through his Instagram account, which has more than 24,000 followers. Celebrities such as rapper Waka Flocka, Nets guard D'Angelo Russell, and Kings guard Iman Shumpert have all been spotted wearing his designs. It's an impressive accomplishment, especially considering that Ransom started the label in 2011 with no background in sewing. "I was just sitting around thinking about fashion real heavy, and I wanted to make a shirt," said Ransom, who had done marketing for a friend's clothing brand. After brainstorming for a couple of weeks, he came up with the name Leader of Cool Moons, a nod to his affinity for time and space and wanting to stand out in a way that made you scratch your head. Ransom decided to teach himself how to sew, starting with a friend's old sewing machine. "I was taught how to thread the machine and everything was on me after that," he said. "I would practice daily getting my lines straight." He said making patterns was easy, but figuring out which fabrics worked together was more difficult. "My first couple of rolls of fabric were jersey knit and silk. It was frustrating, because I was trying to get stretchy fabrics to work with satin, which has zero stretch. It caused a lot of errors, and my first legit garment didn't come until 10 weeks later." Three years went by, and after successfully making a couple of shirts, he focused on building his name locally. Instagram played a big part in attracting attention, helping him get in touch with stylists, models, and other influencers. As his followers began to increase, he officially launched his brand in 2015 and began selling his clothes through social media. During this time, he noticed some celebrities commenting on his posts, so he reached out to them about wearing his stuff. Even before delving into fashion, Ransom, who grew up playing football, had a deep interest in style. "The '90s made me," he said. "I go back to the '90s mentally whenever I am designing. I pay attention to cuts and things my girlfriend likes to wear. The weight of fabrics. They don't make fabrics like they used to." He keeps his collections small, which allows him to focus on the details of his garments. The brand is composed mostly of outerwear: Denim jackets, bombers, football and baseball jerseys, as well as hoodies, tees, sweatshirts, and baseball caps, ranging in price from $45 to $250 a piece. Most of his clientele are between the ages of 17 and 25, giving him a customer base that is highly attentive to pop culture. "I feel like I can be in Barney's and Neiman's and still relate to that kid in high school that's late for class," he said. Ransom certainly isn't short on aspiration — or confidence. When asked who he believes his competitors are, he listed established designers Rick Owens and Vivienne Westwood, whose punk-inspired designs no doubt influenced the aesthetic that Ransom draws from. But perhaps it is this same self-assuredness that has helped catapult Ransom's business. "People psych themselves out of their own dreams. I'm not trying to do that," he said. "There are no rules. The average person can set their mind to do something and really be amongst the mass of people who went to school to do what you want and really flourish. Don't be afraid to stand out in awkward ways or ways that aren't along the norm of what people are used to. Do you." In the Bay Area, Ransom is in good company. Among the local brands that he expressed affection for is San Francisco-based Fade to Black, whose tees are a nostalgic nod to '80s and '90s bands, and whose logo pays homage to Metallica. There is also Benny Gold, the big Bay Area streetwear brand that has developed a strong following since 2007, selling in hundreds of stores and being distributed worldwide. So, what's next for Ransom, whose workspace is overflowing with fabric and starry-eyed possibilities? "I'm trying to open my flagship store off Telegraph in Berkeley," he said. "It's something I've wanted since day one. I am inspired by Berkeley, just the whole culture of being amongst the collegiate kids. There's so much flavor down there. Everyone has their own style. I can sit there and people-watch. That area has all the swag." He also plans to drop Leader of Cool Moons' newest collection, Gender Doesn't Count, on Feb. 19. Featuring new prints and embroidered labels, the clothes will focus on attitude and approach instead of the gender norms of men and women's fashion. "Clothes have no gender in my world," he said. "Having a genderless brand takes a lot of pressure off the designer. I like fabrics that are normally associated with women's patternmaking, mixing them with a harder aesthetic that could work for a man or a woman. Not only can a woman wear a purple see-through jersey top with an orange denim jacket, but also, I, a man, can and get compliments and reactions. For more information, check out LeaderofCoolMoons.com.